Looking for beautifully groomed nails that add elegance to your personality? In the era of technology where people have progressed from horses to rockets, paper printers to makeup printers, getting well groomed nails would not even be considered an accomplishment. Using simple nail paint, you can hide the choppiness and paleness of nails. In case you are also looking for innovation then take a step forward. Instead of one take two nail paints and make a crisscross design on your nails. Doing so will add exclusivity to your nails- this exclusivity is called nail art. You can combine as many shades as you want, draw any form any shape on your nails to decorate them in your own style or say “art”. While very detailed nail art can be left to professionals but there many easy designs that you can create at home. I prefer going for simple nail art designs as they are less time consuming and require less perfection. While creating such designs, I do not need to worry about wrong angles and crossing the boundaries . Most of the designs shown below have simple geometrical patterns. 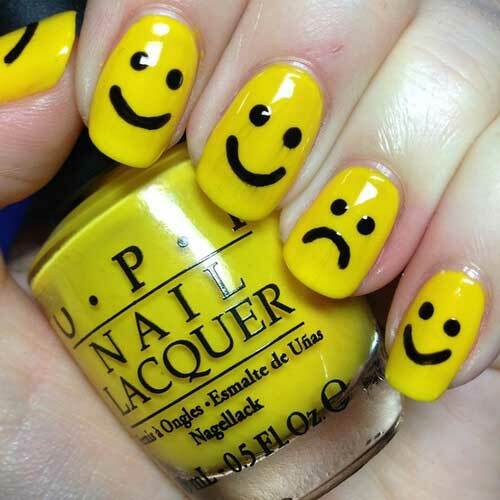 Even if you are naïve at doing nail art you can create these designs with utmost ease. For basic nail art technique, you might want to have a look at the nail art tutorial, which I shared long time back. This nail art tutorial speaks of creating geometrical patterns using cello tape. In case you are a ‘perfection-freak’ then you should definitely have a look at that tutorial as it will help in creating immaculate designs. Simple and sober – basic french manicure with pink base and some random dots over it. Does not it look simply and easy ? Follow the geometrical pattern tutorial shared above and create this art with utmost ease. Love the bright color combo used in this design- quite appealing. Another version of french manicure with some polka dots. Ain’t these smiles cute ? They remind me of fun times. 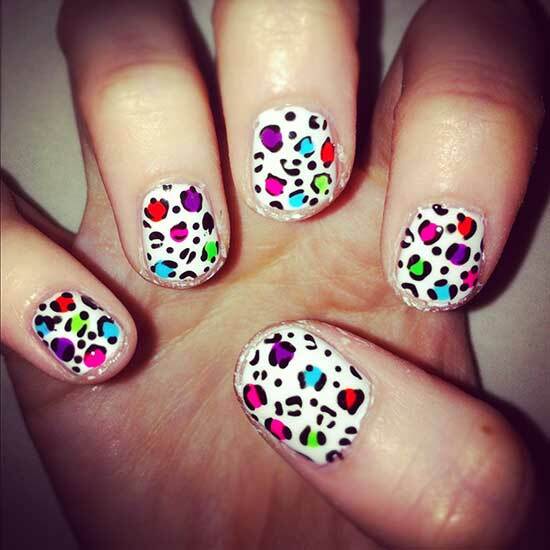 Cute leopard nail art, easy to do and best to flaunt. Zebra print nail art- choose the base color and draw zig-zag lines on it. Lovely compilation, loved all the designs. hehe.. the leapord, zebra and newspaper nail arts wont require perfection Nisha.. so you can absolutley try them at home ! Sure Poo.. please go ahead I would love to see them on your nails ! All your designs are simply awesome! M really bad at nail art but can at least try the smiley and polka dots. Wonderful creativity Shailja! Thanks Anshu, do try these designs ! Newspaper nail art is my fav .. and it is very quick too ! hehe.. these desgins wont take much of your time. These are all such cool designs! I love all the nail arts, il try something tonight. 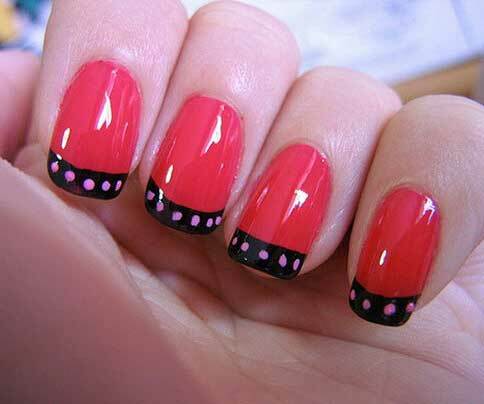 these nail are super easy, I want to try newspaper nail art and polka dots nail art. Loved all the designs specially Geometrical & polka dots. will definitely try today. Thanks.